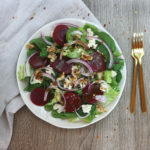 Yup, it’s another salad, this time with beets, tofu feta, walnuts and my family’s favorite balsamic dressing. This is a dressing that I make all the time and every time, they say that I should bottle and sell this one! I sure hope that you enjoy it as much as we do. I used a mixture of spinach and romaine because I love the texture combination. Sometimes a spinach salad seems a little flat to me, adding the crunchy romaine makes it much more interesting. We actually all like beets too, so this salad was perfect for everyone in the family. 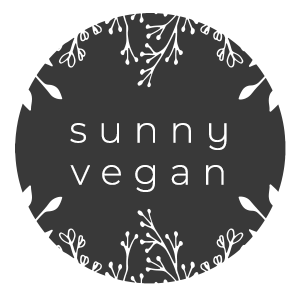 Let me know if you try this, or any of my other salad recipes and enjoy! A light yet filling salad full of flavor and texture. Mix greens and divide onto 4 plates or a large platter for serving. Top with remaining salad ingredients, tofu feta, and drizzle with balsamic dressing to taste. Add all ingredients except tofu to a bowl and mix well. Add cubed or crumbled tofu and marinate for 2-6 hours. Remove tofu from marinade before serving. Add all ingredients to jar with lid and shake well. It’s no secret that I eat a LOT of salads. Actually, I will have a salad for breakfast quite often and this one with grapefruit and avocado is perfect. 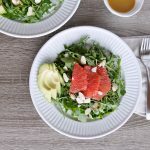 The peppery arugula with grapefruit and avocado, both breakfast staples, is great for breakfast or any time of the day. My daughter thought this was one of the best salads I’ve ever made, and I will have to agree with her- haha It not only tastes great, just look at those colors, that certainly brightens my day. Do you ever eat salads for breakfast? Let me know if you try this one, I’d love to hear what you think! 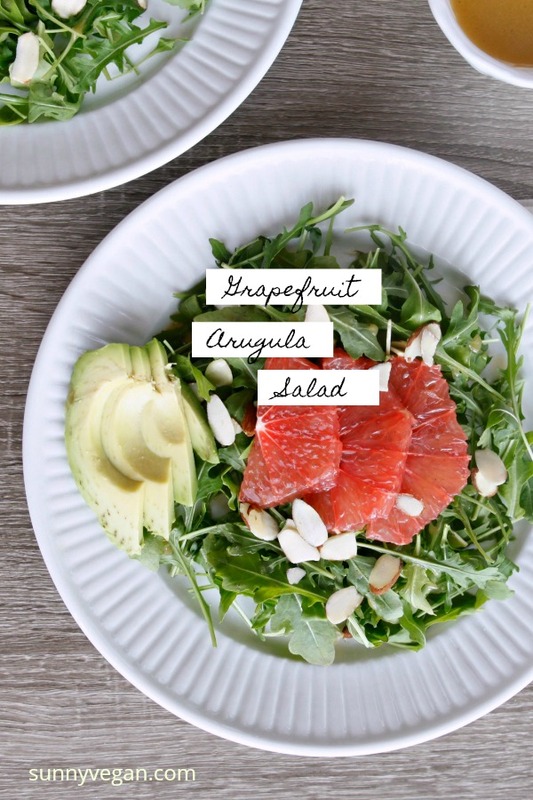 Peppery arugula combined with tart grapefruit, creamy avocado, almonds and a light vinaigrette make this salad simply amazing. Peel and slice 1 grapefruit 1/4 inch thick. Juice 1/2 grapefruit for the vinaigrette. For individual servings, divide arugula into 4 servings, place on a plate. 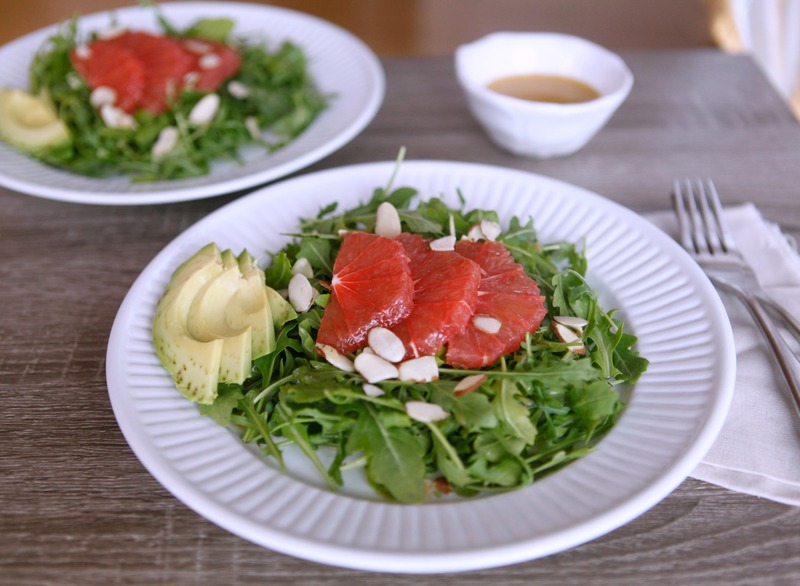 Top with grapefruit slices and 1/2 sliced avocado, drizzle with dressing and add 1 Tbsp almonds. Place all ingredient into a jar, shake until combined. 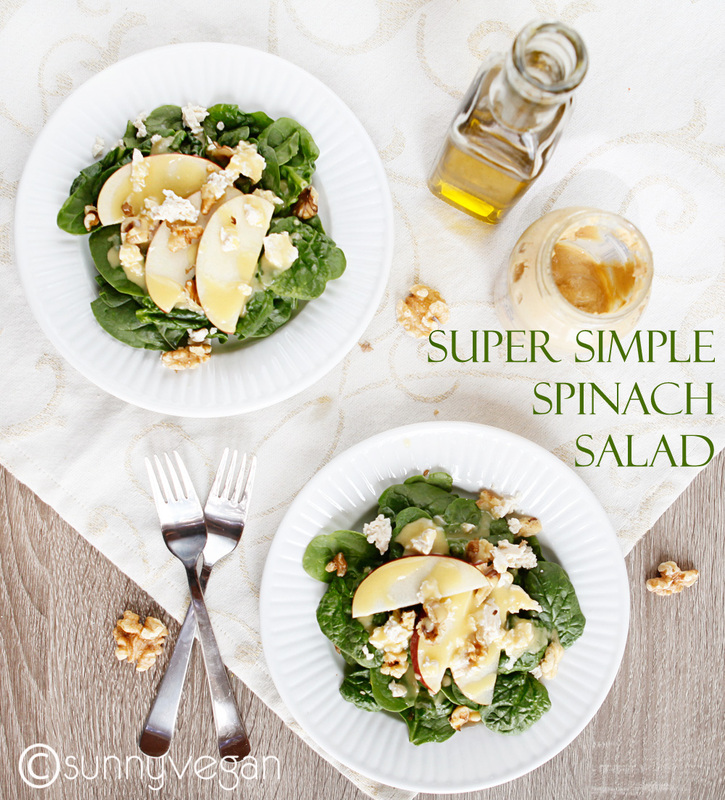 Spinach is one of my fave veggies, especially in a salad. While I eat lots of salads, there is something that keeps me coming back to delicate organic baby spinach. The amount of spinach I go through is almost comical. I toss it into smoothies, pasta, vegan creamed spinach, and tons of salads. This is one of my faves – first, because it is so simple, and second because it’s delicious! When I was contacted by the American Macular Degeneration Foundation about their #EatRightForYourSight campaign, I was totally in. I truly believe that food has the power to heal or make you sick and focusing on foods hight in antioxidants, omega 3’s and healthy fats can be great for your eyes. Just one cup of spinach has lots of of lutein and zeaxanthin—two nutrients that do wonders for your eyes. 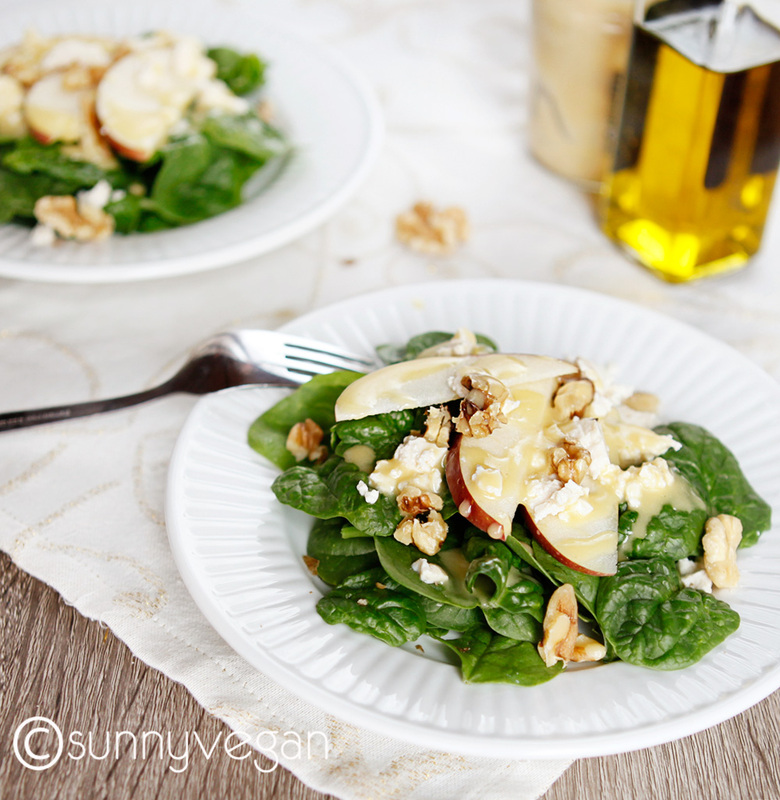 Walnuts contain those omega 3’s as well as zinc and the olive oil in the dressing has healthy fats for you too. I hear all the time that eating healthy is TOO complicated, I don’t have time to prepare fresh food and blah, blah, blah. 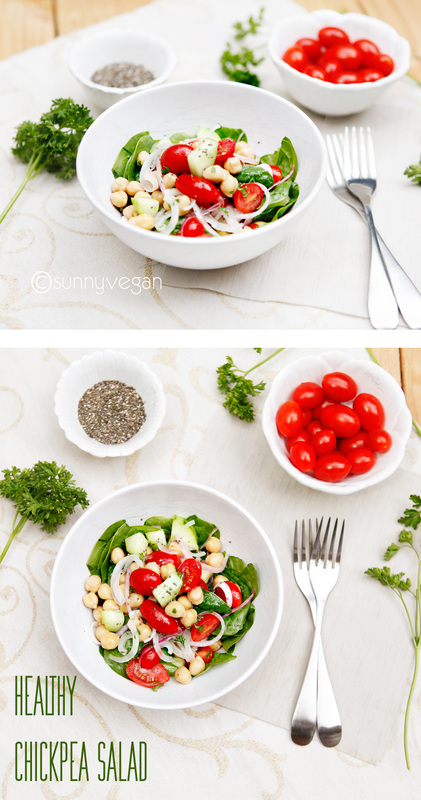 This salad took less than a minute to make and I’m sure you can spare a minute to improve your health. So eat up my friends! layer salad ingredients into bowl or onto serving dish. combine dressing ingredients in large bowl and whisk until combined. drizzle over salad mixture and serve immediately. I’m a sucker for pretty food! 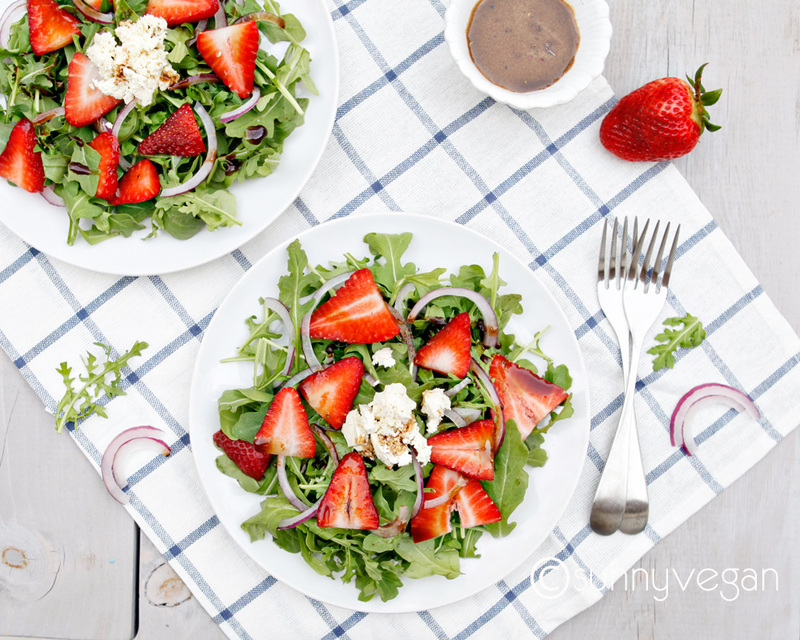 Fresh produce is so beautiful this time of year that I am always trying to find new ways of combining my favorites and this strawberry arugula salad is chock full of beauty. I eat lots of vegetables but have a harder time eating fruit for some reason. 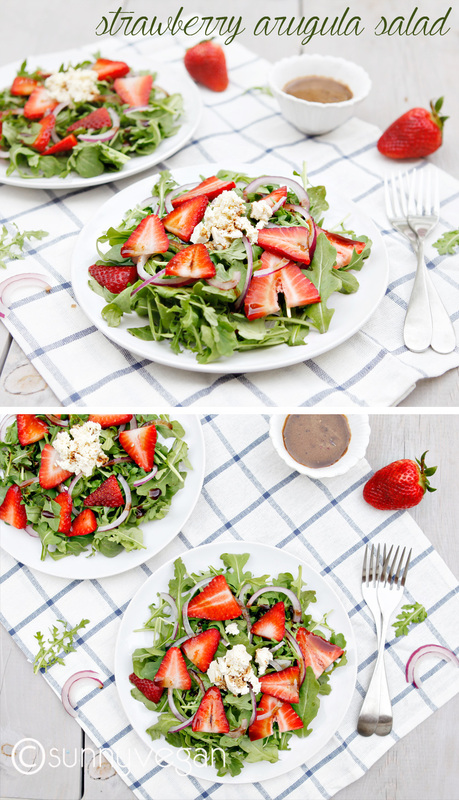 By adding strawberries to the salad, I get the nutritional benefits in a beautiful salad. 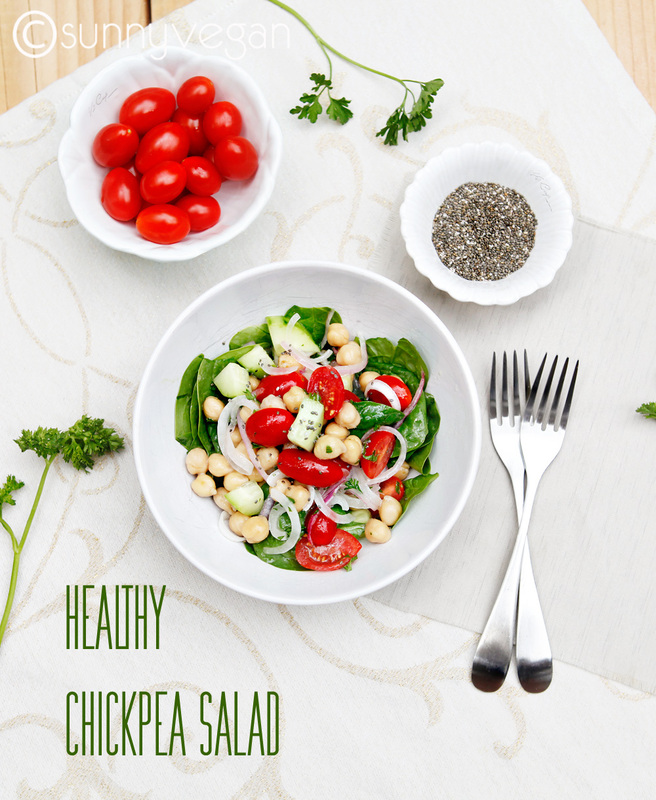 If you think salads are boring, you may want to give this easy one a try. layer arugula, berries and onions into bowl or plate, top with crumbled tofu and drizzle dressing over top. toss if desired, serve immediately.